This sounds like a heck of a patch. They still need to add an endgame progression system beyond “hope for better drops,” but this is real progress. Yeah, I’m really happy with this list, especially in terms of qol stuff and annoyance removal. That’s only in there because all you people tolerated that static hub nonsense in the Mass Effect games! The fact that you fly around in what is supposed to be the most advanced warship in the galaxy and never get to fight anything in space is the greatest crime of Mass Effect. Died at Furies and got locked behind glass/fog after respawning. Didn’t get loot after. Checked all javelins at forge after. Matched into an instance of Tyrant Mine at last boss and died second before helping down boss. Wasn’t revived before countdown ended. Didn’t get loot after and checked forge. Getting nothing but purples and blues from GM2 HoR runs is also bad. Not sure on the first, but you should definitely get loot for the second. You might need to end another expedition and check the forge again. Or pop into Freeplay, tag something, then exit. Check forge, close game, then log back in and check again. I usually get a message at log in where there is “missing” loot found. Swimming Hint: Always enter the water moving forward at full thruster. That lets you retain complete control of your movement, without having to wait out the bit where you normally bob around and get disoriented. The "loading screen takes extra long to only stall at 95%/dump you with “lost connection to EA server” still happens and A on gamepad nor space work only mouse click works to clear the error. Bah. Looks like everyone who previously played it on my Origin friends list has abandoned it for The Division 2. It’s been out a month so everyone giving it a $15 try with Access will be disappearing too. I am, though I might well be back if there’s any kind of expansion. While I am also playing div 2 at the moment I will go back to Anthem as I like it better once I am through with the div 2 story bits. Want to give Anthem a break to let them fix it up some too. That makes a lot of sense, really. After all, nothing new has been added. This next patch is looking to bring a ton of fixes and qol improvements, but not tons of new content (unless you are into vanity items like vinyls and emotes, in which case, it might be worth your time to do at least one stronghold a day, ideally with friends). Yeah I’m also playing Division 2. 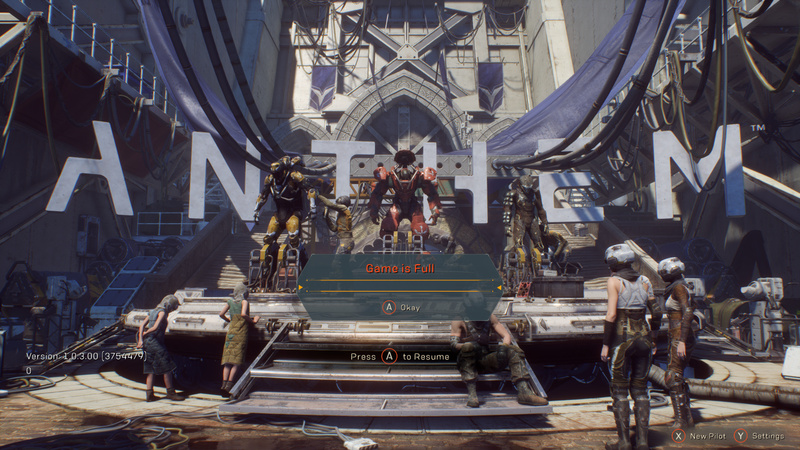 It’s in a lot better shape than Anthem, but Anthem’s setting and core gameplay appeal to me more (although Division 2 is quite good as well). These aren’t subscription based MMOs, so I’m really looking forward to bouncing between them as they each release new content and updates! I’m itching to get back into Anthem, but I’m waiting for some loot overhauls. Maybe 1.05 or somewhere around there. I think Anthem’s setting COULD potentially appeal to me more, if they really did anything with it beyond some fairly rote story missions. The Division games (both of them really) not only fully realize their worlds, they explore them in-depth. Anthem has some wacky lore with the “Anthem of Creation” and whatnot, but all that amounts to is occasionally coming across a machine you need to pick up missing bits for, and fighting an Ursix here or there (which is apparently the only large beast the anthem can think of). TD2 just leaves it in the dust - especially in the end-game, when the city becomes a full-scale war zone for control of everything at all times. Why would they? Aerial movement actively takes away from tactical depth of the game. Warframe suffers from the same issue. Warframe suffers from the same issue. Not to derail the thread into another game. Except I guess I am. In most tilesets “aerial” is fairly limited, so is this about the open world zones? It’s an insanely fun feature but it completely invalidates level design and enemy unit composition.